8 Inch silver plated charm bracelet, w/ large lobster Clasp (I have other clasps if you prefer, just let us know) Let me know if you need this sized. I purchase the images from a collage artist, re size and fit the images into the photo charms then finish them with a glossy Resin seal! These photo charms are 22mm round, very nice quality! 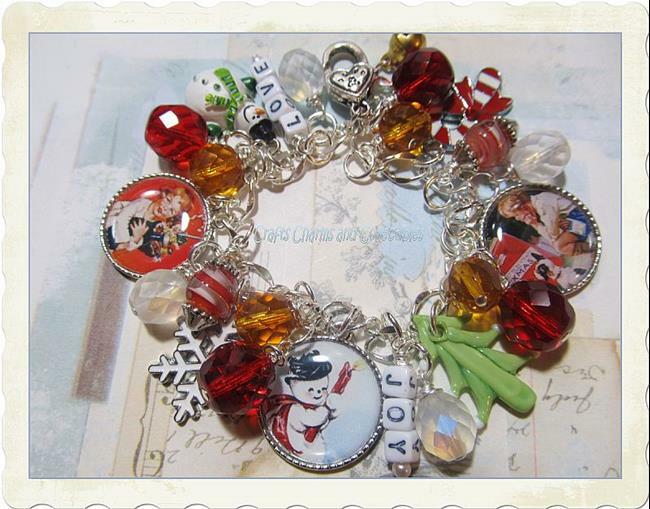 I assembled this bracelet with cute vintage Christmas images that warm your heart. I used classic Christmas colored glass beads, and up cycled jewelry findings. Beads are Czech glass sized 10 - 12mm in colors of frost, gold and red. Red glass swirl beads and cute word charms I made by hand.